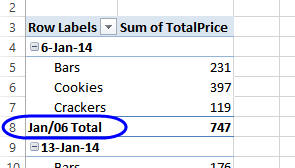 If your pivot table has only one field in the Row Labels area, you won't see any Row subtotals. 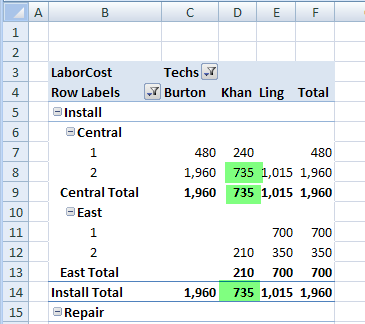 In the pivot table shown below, Service is in the Row Labels area, Lead Tech is in the Column Labels area, and Labor Cost is in the Values area. Because Service is the only field in the Row Labels area, it has no subtotal. When you add another field to the Row Labels area, a subtotal is automatically created for the first field. In this example, the District field is added to the Row Labels area, below the Service field. The Service field is an Outer Field, because there is a field below it (District). The District field is an Inner Field, because there is NO field below it. Because Service is now an Outer Field, it automatically has a subtotal after each Service type. Each subtotal shows the name of the Service type, and "Total", such as Install Total. If you add another field to the Row Labels area, below the District field, the new field becomes the Inner Field, and District changes to an Outer Field. In the pivot table below, the Technician Count field was added below District, and the District field now has a subtotal after each District name. In a new pivot table, when you add multiple fields to the Row Labels or column Labels areas, subtotals are automatically shown for the outer fields. In the screen shot below, there are two fields in the Row Labels area, and subtotals are shown at the top. 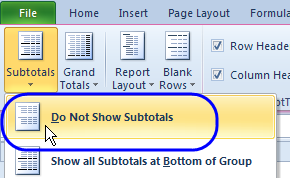 If you don't want to see the subtotals in a pivot table, you can follow these steps to turn them off. 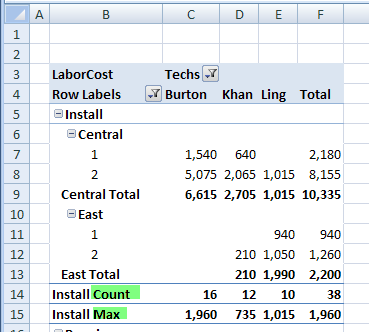 On the Excel Ribbon, under PivotTable Tools, click the Design tab. 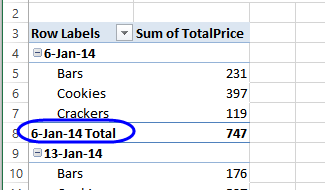 All the subtotals in the pivot table -- for both rows and columns -- will be hidden. Instead of hiding all the subtotals, you can turn subtotals on or off for a specific pivot field. To hide the subtotal for a specific field, follow these steps. 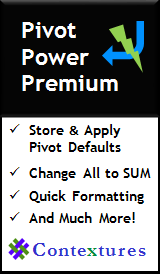 Right-click one of the labels in the pivot field where you want to hide subtotals. In the pop-up menu, click on the Subtotal command, to remove the check mark. The subtotal for that field will be hidden, and other subtotals will not be affected. In a new pivot table, when you add fields to the Row Labels area, subtotals are automatically shown at the top of each group of items, for the outer fields. You canmove the subtota ls to the bottom of the group, if you prefer. To move the subtotals, follow these steps. In the Layout group, click Subtotals, and then click Show All Subtotals at Bottom of Group. Column fields are not affected by the setting for Subtotals. Column subtotals always appear at the bottom of the group. The labels for the outer Row fields are always above the labels for the related inner fields, even when the subtotals are at the bottom of the group. 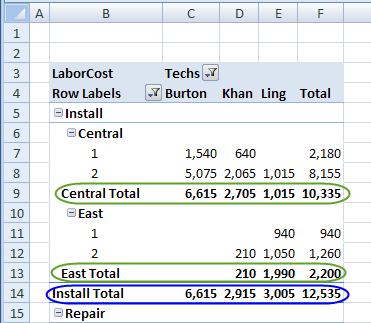 The position of the subtotals is also affected by the Report Layout applied to the pivot table. In Compact Form and Outline Form, you can show the subtotals at the top or bottom of the group. Watch this video to see how to move the subtotals to the top or bottom of a group, and see how the report layout affects the subtotal position. 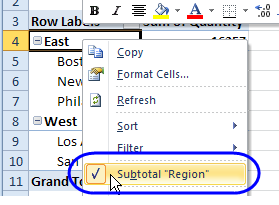 When a subtotal is added to a pivot table, its Summary Function is set to Automatic. With that setting, the subtotal automatically uses the same Summary Function as the Value fields in each column. In the pivot table shown above, the Value fields are using the SUM function, so the subtotals also show the SUM of the values. In the pivot table shown below, the Value fields have been changed to the MAX function, so the subtotals also show the MAX of the values. A few of the MAX values are highlighted in green, to show that the values and both subtotals are the same. Even though the Summary Function has been changed to MAX, each subtotal still shows the name of the item, and "Total", such as Central Total. Instead of using the Automatic setting for subtotals, you can create a custom subtotal in a pivot table -- either a single custom subtotal, or multiple custom subtotals. Watch this short video to see the steps, and the written instructions are below the video. 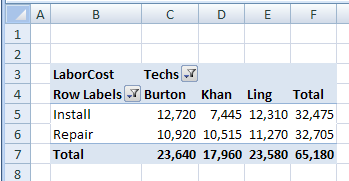 Right-click a label for the field in which you want to change the subtotal. In this example, right-click cell B5, which has the Install label. 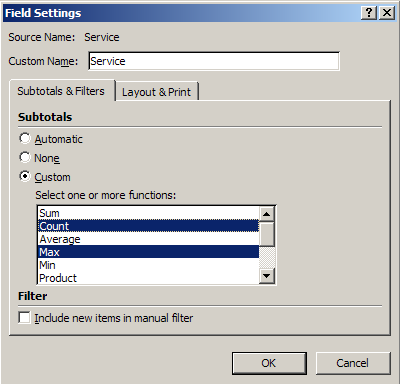 In the Field Settings dialog box shown above, there are two functions, Count and Max, selected in the list of Summary Functions for the Service field. 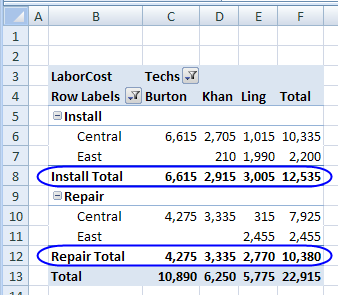 After selecting these functions, the pivot table shows two subtotals for each Service type. When you use Custom functions, the subtotal row shows the item name, and the name of the Function, such as Install Count. 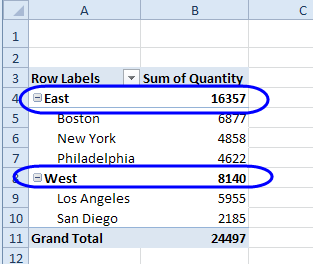 The subtotals for District are not changed, nor are the other values in the pivot table. 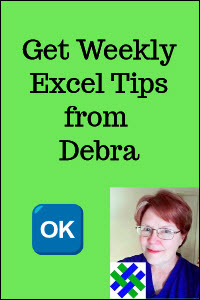 View the steps in the short Pivot Table Subtotals video, in the previous section. Automatic subtotals will appear for normal fields and calculated fields in a pivot table. However, custom subtotals will not appear for calculated fields. The custom subtotals will be blank for any calcuated fields in the pivot table layout. In this short Excel video tutorial, you can see how to create custom subtotals, and see the missing custom subtotals for the calculated fields. This problem occurs if you select the date cells and format them, and then add subtotals. To prevent the problem, change the Number Format of the date field, by following these steps. Right-click one of the date field labels, and in the popup menu, click Field Settings. The subtotal number format will now match the other dates in the field. View the steps in a short Subtotal Date Format video. Click here to download the sample file for the Subtotal Date Format tutorial. The file is in xlsx format, and does not contain macros. Click here to download the sample file for Pivot Table Custom Subtotals. The file is in xlsx format, and does not contain macros.